110QD-2 Steel Slide series. Jonathan Engineered Solutions offers a complete line of high-quality industrial grade steel drawer slides. Our array of industrial grade steel slides includes ball bearing drawer slides, friction slides, roller bearing drawer slides, and solid bearing drawer slides. 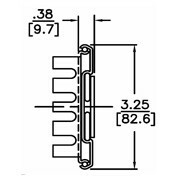 The 110QD-2 series steel slides are 3.25" x .38" wide and manufactured in carbon steel with standard zinc plating. The 110QD-2 is a 2 section slide with a load rating of up to 125 lbs. The majority of our steel slides are custom engineered for specific applications. We also carry a broad line of standard steel slides, available with various lengths, travels, features, functionality, and more. 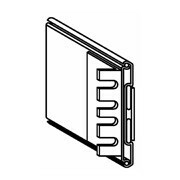 With an accumulated mechanical engineering knowledge base that relates to industrial grade steel slides, custom manufacturing capabilities, and a global footprint, we are the ideal source for all of your drawer slide requirements. Rear bracket adjustability of 2"
Rear bracket adjustability up to 6.50"